After yet another deep and shaky breath, Abigail grasped the knob and opened the door only to gasp in fright. Before her on the threshold of her dwelling was a tall, dark, and mysterious stranger with a hood draped over his features. With a hand over her heart she leaned down in an attempt to peek under that secretive hood. She tried to speak and question his identity, but he interposed with a rather soft, soothing, but deep voice. "Don't be alarmed, miss," said the stranger. He lifted his head and only partially revealed his face. Abigail discovered the dark creature to be a Shadow Gelert gentlemen and lifted an eyebrow. "Who are you?" she asked. "My name is Detective Malcolm," replied the Gelert. "If you please will allow me to come inside from this cold rain, I shall tell you why I have come." Suspicious, Abigail permitted the shady-eyed visitor into her warm home as he seated himself in a plush chair in the living room. "Would you care for a cup of hot tea?" "Yes, that would be nice," the detective answered. "Thank you." Abigail forced a small smile as she quietly walked into the kitchen, watching him carefully behind her narrow shoulder. He seemed to be quite honest by his voice and disposition, but his outward appearances seemed to call a warning. There was no solid wall separating her from her house guest, but instead there was a wide opening that revealed the bar in the kitchen, enabling Abigail to watch his every move. Walking back into the den with teacups quietly clattering on the tray, Abigail served him his drink as he took it gently and graciously. "Thank you," he repeated. "You are very kind." "It's not a problem," Abigail answered and set down the tray on the nearby coffee table. She looked up at the Shadow Gelert sipping the steaming tea, unable to drink tea herself for she had many questions to ask of this mysterious investigator. "You say you are a detective?" "Yes," replied Malcolm the Gelert. "I was visiting Mystery Island between cases in my work and I just happened to stumble upon your tragic story. Tell me more about your missing Neopet." Abigail placed her hands on her knees and inhaled a breath. 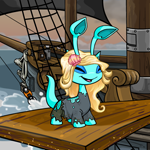 "Well, my Neopet is a female Aisha named Jane. She and I were very close since forever I suppose, but, a little over a year ago, Jane began changing. She absolutely loved the sea, teetering on the brink of obsession with it. She wished to stay near the it all the time, swimming, collecting seashells..."
The young human girl looked up to see Detective Malcolm staring at her intently. She stopped in hesitation. "Please, keep going, Abigail," Malcolm said. "And why is that if I may inquire?" asked Malcolm curiously. "Well, to make a long and dreadful memory brief, I was only around three when I fell overboard off my parents' yacht and nearly drowned. I've never been able to recover from it." Malcolm still gazed at Abigail in interest, but nodded slowly and urged her to go on with her testimony. "Jane had long been frustrated with my fear of the sea, unable to comprehend because sometimes her wild imagination blocked out any logic. Soon, she started to beg and plead with me to give her a Maraquan Paint Brush, or, what she called fins. You see, she wanted to go out there in that big, cold, scary place all on her own! It didn't matter to her how I felt; and so, I refused to give her such a powerful item. Jane became utterly consumed by obsession, and, one morning, she was gone." "Was there any sort of disputes between the two of you before her disappearance?" Regrettably, Abigail sighed, "Yes, but only one very bad argument. We had our little quarrels, but it was this rage that had surged from within us, from not communicating with one another! She was distant. That night, we apologized and reconciled, or so I thought." "What was Jane's behavior like the last time you saw her?" "Depressed, disheartened, blue," replied Abigail simply. "I tried to cheer her up, but I never realized that she was planning her escape right there where I sat. I was so blind!" Detective Malcolm ceased writing and clicked his pen when he glanced up to find Abigail sobbing in her hands in sorrow and pain. The Gelert quietly stood up from his chair and stepped over to Abigail, placing a paw comfortingly on her shoulder. "Abigail," he said softly. "You must calm down so to tell me the rest of the story." Abigail shot her gaze up swiftly from her tears to meet Malcolm's stealthy face. "What more is there to tell? Jane ran away! She ran away because she hated me for not giving her even the slightest opportunity to gain her wish. She never will return to land now; she's free and happy, what else would she desire?" "Do the islanders and all the locals know of Jane's disappearance?" inquired the Gelert. Abigail rolled her eyes to herself, growing annoyed by the detective's continuous, robotic sounding questions. She brushed the flying brown hairs from her face to behind her ears. "Of course they do! It has been nearly a year since Jane ran away!" Abigail exclaimed. Malcolm reacted from the volume of her voice and backed away. A fleeting look of realization crossed his face. They stared at each other for a few seconds when Abigail sighed and relaxed her tense shoulders. "You are forgiven," Malcolm answered sadly. "But there is a fact you must be aware of, miss." Abigail arched an eyebrow curiously and suspiciously, now noting his strange behavior, making her quite nervous. "And what is that?" she said as her voice cracked. Malcolm gulped deeply and rolled his shoulders in remorse, staring at her straight in the eye. "Well, Abigail, since Jane has been missing and away from your care for nearly a year, you will not be able to remain here in Neopia without adopting another Neopet." A gasp of horror that escaped from her lips left Abigail breathless as her eyes widened in shock. "You see," the investigator continued, "a human's presence in Neopia must accompany that of a Neopet for them to stay and keep their permanent home in Neopia. You have been living here for nigh a year, which exceeds the limit of your stay. It is a law, miss, which we cannot condone." "I have never heard of such a preposterous law!" Abigail blurted out. "There is no way that I could ever replace my one and only and precious Jane in order for my sake in Neopia!" "It is a very secret and feared law, Abigail, that many are not wary of. If a human lives in Neopia in solitary for too long, without the companionship of a pet, and is found out, you will be banished, and never see Jane again. I am one of the few who know of this, and have worked undercover to help those in need, ones like you in this same situation. And you must trust me if you ever want to find Jane." Abigail nodded. "I understand, and I am willing to do anything to get Jane back to me, where she belongs." "Good," Malcolm answered, "because the tasks at hand will require much bravery and facing your fear, Abigail. Jane is at sea, the place you fear most, and that is where you must go to find her, or else, you will have no choice but to leave Neopia and her behind forever." The sea's current flowed through her flying blonde hair as the familiar sounds of the ocean echoed in her ears. Jane carefully gazed over the map Nereid had given her, the only guide she possessed as she lay on her stomach on the back of a large sea creature. Jane knew by the sun's rays shining through the sea that she had travelled for many days into the unknown. For quite some time she and the sea creature swam through bright and colorful reefs populated with aquatic Neopets and petpets, making her feel more reassured about her journey. However, as the hours wore by, the small, pleasant underwater communities diminished until there were none left and the only view before her was the barren sands of the sea bed. A sigh exhaled through Jane's lips as she blinked her tired, heavy eyes, rubbing the corners of them to relax the strain away. She lay her head down on the creature's clammy scales, feeling its breathing and its heartbeat as she enjoyed a moment of tranquil silence. Jane looked over her shoulder to notice one of the pockets of her knapsack was slightly open, but an object inside caused the zipper to progressively open wider under the weight and pressure. She perked up instantly to see it was her treasured picture frame of her and Abigail. Alarmed, she whirled around in an attempt to grab it, but it fell out of her pack to her dismay. "No! No, no!" she cried and looked down as her long hair fell over her head. Her wide eyes gaped at the precious memory of her and her owner descending deeper into the blackness of the water. Frantically, without a thought flowing through her mind, Jane swam after the picture frame, completely abandoning her ride on the sea creature's back. Jane felt a cold shock as she dove deeper into the dark waters where the sunlight barely penetrated the depths. Tears developed in the corners of her eyes as she searched for the picture frame in frenzied sorrow and remorse. Eventually the Aisha fraught with distress realized she reached the bottom when her fingers sank into muddy sand. Jane caused an immense cloud of dust to spread throughout the sea bed, digging in desperation for the only little window to see her owner's face. Coughing, the panicked Aisha sobbed aloud as she continued the vain quest in the sands when she gave out an excruciating cry of pain. Jane looked up from her tears to see red blood floating in the water before her eyes. She clenched her teeth and grabbed her hand that she had sliced open on a rough, black rock buried in the thick sea bed. Feeling ever so reckless and unwise, she placed pressure on her fresh, stinging wound, but the cut still throbbed. She threw her head around in all directions, alert for any predators that might smell her blood from far. "Abigail... Abigail, I'm so sorry!" Jane cried as rivers of tears soiled her scaly face. "I will find you somehow, Abigail!" She listened to her grief-stricken cry echo into the blackness of the ocean, knowing her picture was in the dark, but she knew she could no longer dwell on it now for it was gone. Quietly, she turned away from the dark and swam her way up and out, guided by the welcoming rays of the sun. She emerged into the brightness of day empty-handed, cold, and alone. Her eyes widened to discover the sea creature had vanished. Jane swam about the barren sea chirping and whistling for the creature in an ancient Maraquan call, but it became evident that it was too far away to hear her calling. Miserable and hopeless, Jane slowly sank to the sand, disturbing a small Maraquan petpet hidden in the muck that quickly burst away from her. She stared at her blue fins swaying gently in the calm current; the tips of them were frayed and scarred from narrowly escaping the mouths of hunters. Studying each and every scale that shimmered in the light, Jane was disgusted at herself from outside to the inside. She sacrificed a warm, happy home and a loving owner over a year ago for this? Running from danger at every corner thinking this life would be paradise? She had taken everything for granted, dreaming of the day she would feel the sand between her toes when she ran on the beach again. These fins that had overcome and concealed her former legs were once her greatest desire, but now was her loathsome curse. She had lost everything because of this obsession and passion that engulfed her soul long ago. With a determined glare up at the surface, Jane grasped the tied map at her side, her last remaining possession, and unraveled it. She scrutinized the lines drawn in such exquisite detail on the paper, feeling its power exude and absorb in her hands; she was fully capable of going home. Looking up, Jane felt very startled by the wide, mysterious panorama of the open sea lying before her. Nereid told her, though it was only a mere implication, that it was madness to cross these parts alone and without the protections of strong sea mammoths. However, Jane could not sit and wait for another creature to come to her. She had to head for her destination. Slowly and shakily, she rose from the sandy bed and faced the great sea. She had a price to pay for being as foolish as she had been that could not be avoided. Jane made a vow of redemption before the deep blue that she would do anything in her power to see Abigail again, or else be condemned to eternal misery and loneliness.